You will be met at Beijing airport and taken to check in at the hotel. You may make your own plans for the remainder of the day. 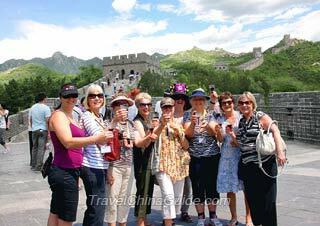 Our guide will offer the orientation of the following day on escorted tours and dining arrangements. After breakfast at the hotel, all nationals on the tour attend a short orientation session for mix and mingle. 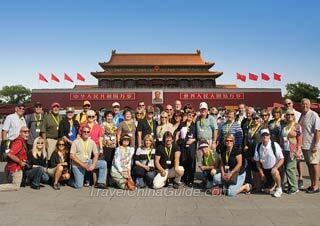 Set off to the first stop, at the Tiananmen Square and then the Forbidden City. There is much to see. Our guide will take you one step further with first hand knowledge. At noon, you will dine on an a la carte welcome lunch (valued at CNY150.00 per person and included in our price) at a very popular restaurant. There are great menu selections including Peking Roast Duck. After that you will approach the Temple of Heaven. It is a former place of worship surrounded by a park. Then you will go to see a traditional Chinese Kung Fu Show in the evening. The buffet style breakfast with variety of food is served at the hotel from 06:30. We suggest you have a hearty breakfast today as you are going to mount the great wall and lunch is not included. After about two hours driving, you will reach the Mutianyu Great Wall, the most popular section. To keep your strength for a great hike on the wall, we arrange the round-trip cable car for you. To add spice on the exciting occasion, we toast you with a bottle of red wine. On the way back to town, you will be driven through 2008 Olympic site dominated by the large Bird's Nest. You can also get a photo opportunity with it as backdrop. 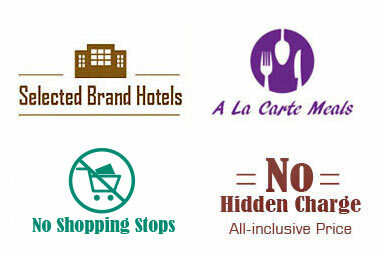 Then a featured local market is scheduled. You will enjoy some free time there to relax. 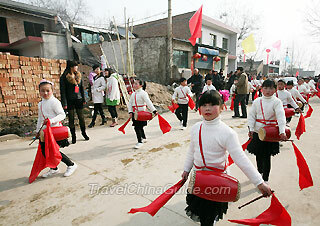 On the last day of Beijing visit you get to see the Summer Palace and the traditional Hutongs. Summer Palace is one of the places where you find refuge from the bustling city center. Narrow alleys connect traditional courtyard residences called Hutongs. A rickshaw ride through those old hutongs is an eye-opening experience. Also a particular arrangement for you is to try your hand at Chinese Paper Cutting, one of China's most popular folk arts. We will serve you an a la carte lunch (valued at CNY150.00 per person and included in our price) at a quality local restaurant. Enough of Beijing, and you are off to the ancient imperial capital, Xi'an, where you will be met at the airport and brought to the hotel. The Terracotta Army is a must when visiting Xi'an. The museum consists of three main excavation pits and one exhibition hall. The figures in the museum include warriors, horses, chariots, weapons and so on. It is estimated that the first Emperor of Qin Dynasty (211-206 BC) constructed such a large army format aimed to protect his mausoleum. Till now, the excavation work is still ongoing. Then pay a home visit. You will socialize with the host family members and join them for lunch (valued at CNY120.00 per person and included in our price). Proceed to Xi'an Museum and Small Wild Goose Pagoda after lunch. This evening, dine on the local special dumpling dinner with the Tang Dynasty Music and Dance Show. In the morning, we will first head to the City Wall Park, a popular venue for local people to relax and take part in various activities. A Tai Chi practice will be arranged for you here. Then go on a visit to the City Wall. Originally built as a military defense system, it consists of walls, gate towers, suspension bridges and city moats. 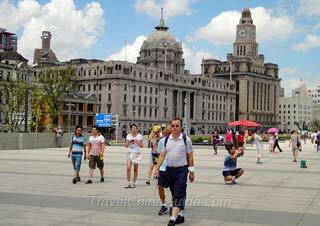 Nowadays, it has become one of the landmarks of this ancient capital city. After an a la carte lunch at a nice local restaurant, you will be driven to Shaanxi History Museum, an admirable place for visitors to appreciate the cultural treasures. Later, continue to the Muslim Street. It has been a prosperous commercial street since ancient times, and now it becomes more and more popular among tourists with its distinctive features. Going across the bustling street, you will reach the tranquil Great Mosque, which is one of the most famous mosques in China. It was first built during the mid-seventy century when Islam was introduced to Northwestern China by Arabic merchants and travelers. 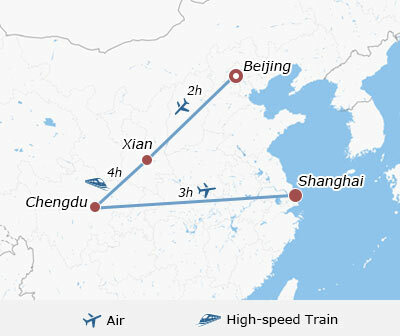 A morning high-speed train will take you from Xian to Chengdu in about 4 hours. Our guide will meet you at the railway station and help you check in at the hotel. Relax during the rest of the day. 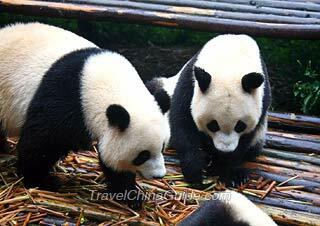 The Research Base of Giant Panda Breeding cannot be bypassed when one visits Chengdu. We show you the panda center in the morning when pandas are the most active. You will sure be entertained. After that, we will take you to explore the Broad and Narrow Alleys. You might have your own lunch there to taste some popular Sichuan food. In the afternoon, pay a visit to the Jinsha Site Museum, which supports dating Chengdu city settlement back to 611 BC. Its heritage reflects on everyday life. People in Chengdu have the reputation for their carefree lifestyle, so the last stop today is to have a tea break and take a glimpse on the locals' living style in Renmin Park. Today you will be taking a flight to your last scheduled destination: Shanghai. Expect to be met and taken to the hotel for check-in. The rest time of the day is free for you to explore the city. If Chinese history, culture and art, is right up your alley, then Shanghai Museum is the most informative. Then off to the Yu Garden, which is a classical Chinese garden. It includes trees, flowers, and also ponds, bridges, rocks, pavilions, and halls. If you are hunting for small gifts or souvenirs for families or friends, the nearby lively Yu Bazaar is good place. You will be at the a la carte farewell lunch (valued at CNY120.00 per person and included in our price) at a fancy restaurant. You will spend the afternoon to discover the Former French Concession, take in the Bund area and have a one-hour cruise tour on the Huangpu River. Bon voyage at the hotel lobby from Travel China Guide. Today's transfer from hotel to airport is not included in the package as the flights' time of group members are different. You need to find your own way to the airport for your homeward flight. The most convenient way is to take a taxi. It costs around CNY150 per cab to Pudong Airport and CNY200 to Hongqiao Airport. We hope you have a nice trip home. Our agent was very responsive and everything was in English so there were no problems. Looking forward to the trip! Thank you for all of the excellent arrangements. We really enjoyed our vacation and will recommend you to all of our friends and family. Meals: We totally enjoyed the meals that arranged. The food was always extremely well prepared and honestly it was the best Chinese food that we have ever had. The quantity was always sufficient and the environments were nice. Guides: Our guides were always very well prepared with local knowledge, could answer almost any question that we could think of during our trip, and offered interesting information without being asked. The quality of English by each guide was sufficient for the trip and we taught them some English while they taught us some Chinese. Each guide provided us with surveys, envelopes and privacy to complete them. Drivers and Cars: The drivers were always polite and the cars well maintained. No concerns. The hotels were always first rate and totally enjoyable. Wonderful selections. The trip was fantastic! 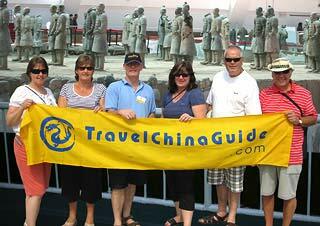 Each guide in each city, Tony, Peggy, Alice, and Vivian, made us feel very welcomed in China and was very informative. We had no troubles getting picked-up or dropped-off at the airports. The itinerary in each city was well planned. We enjoyed taking a guided small group tour. We will recommend your services to others. China is a beautiful country with warm and friendly people! Thank you for a wonderful trip. I recently traveled with my friend to China through TravelChinaGuide and wanted to share my evaluation here. Overall this was an extremely pleasant group tour. The amount of time devoted to activities seemed just about right. We did have to convince our guides to give us some free time for shopping, but they were agreeable. The guides in Beijing and Xian were wonderful – very accommodating and concerned about our welfare. Thank you for a truly amazing experience! We loved this country and enjoyed all our stops! Janet was our appointed guide and she was very friendly and extremely helpful. She spoke a beautiful English and she was always happy. She even taught us how to count in Chinese. The restaurants we went to served wonderful food and we quickly learned to use the chopsticks! Beijing was a highlight, and we will recommend it to everyone! Grace was our appointed guide in Xian and she was helpful but definitely not on par with Janet. She seemed a bit less enthusiastic but tried. The Western food was not a success - but all the other meals were delicious. We were met by Jahrva (I'm not sure how to spell her name!) at the station and she took us to the hotel. Such a wonderful girl! She was extremely helpful and friendly and sweet! She was very enthusiastic about everything she told us about and we had fun with her. I enjoyed the group tour to China very much. All guides were fine. Each one was individual and all seemed to be knowledge, positive and hard working. I thought the distribution of time was well spent at each destination. However it would have been nicer in Beijing to have more freedom in how to spend your time at each destination. Also maybe extend the package to have an extra day in Shanghai and of course increase the price slightly. Hello, Is it possible to take Maglev from Airport Departures to Longyang Station? I just want to ride the maglev from airport to Longyang Station and back to airport. Do I need to switch trains at Longyang to return to the airport or can I stay in the same train? Yes, you can buy a round-trip ticket and then check-in again when go back to the airport. then take the train from Beijing west railway station to Hong Kong. does this count as 144hrs visa free? Yes, it works for the policy. Have a nice trip! Where does the Long Distance Bus drop you off in Xitang? How long a walk to get to the Wolong Bridge? The bus gets to Xitang Bus Station. It is around 3km to Wolong Bridge. You may walk there in half an hour.